Toddler Approved! 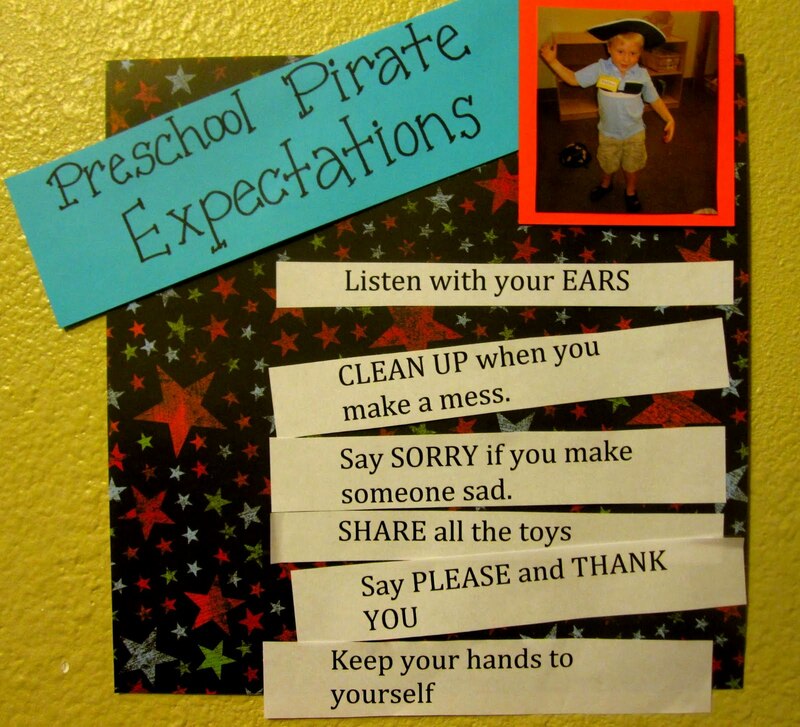 : Preschool Pirates says Argh! 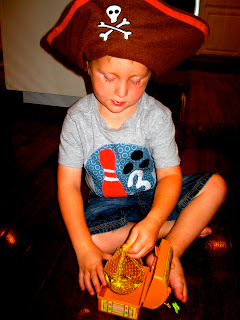 My little three year old started preschool this week. He is really into pirates lately (ever since an awesome b-day party thrown by my cousin Jenny)... and he's been begging for a treasure hunt for weeks. I finally came up with one the night before preschool started. I wanted the night to be special and fun and I also wanted to spend some time talking about expectations we had for him while at preschool. While I finished up the treasure hunt, he read How I Became a Pirate with his dad. It is a really fun book written by Melinda Long and illustrated by David Shannon. I hid the clues taped to small prizes (little books and learning toys from the $1 Target aisle) around the house. My clues were seriously hokey... but I tried to get them to rhyme. :) At the bottom, after my little guy solved the clue and filled in the blank with the right word, there was a clue to tell him where to go next in our house. I gave him a treasure map with little circles. When he solved a clue, he got a letter sticker. 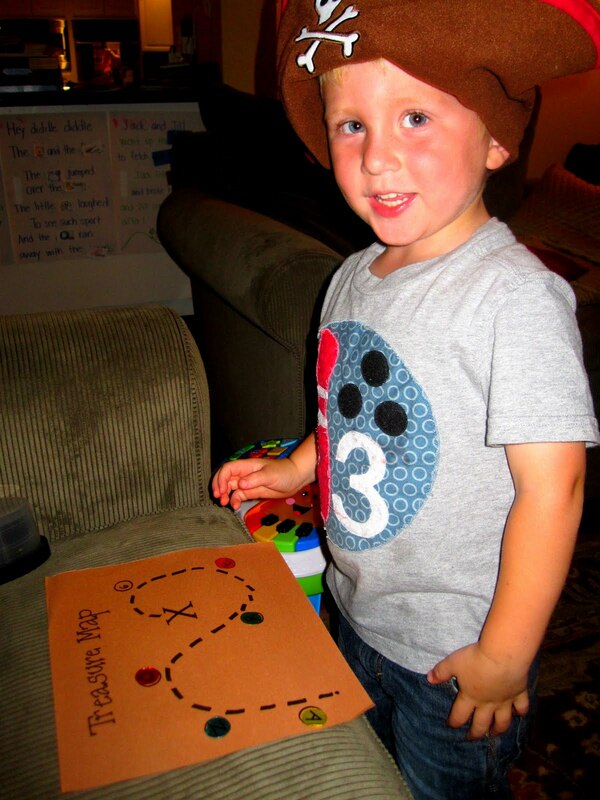 After he found all of the clues, he discovered that the stickers spelled his name! 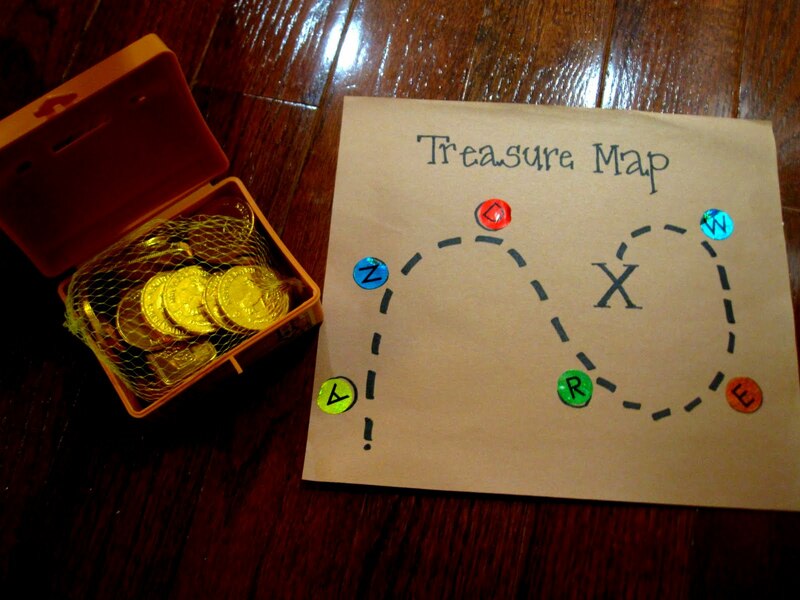 At the end of the hunt he found the ultimate pirate treasure- GOLD COINS (filled with chocolate)! 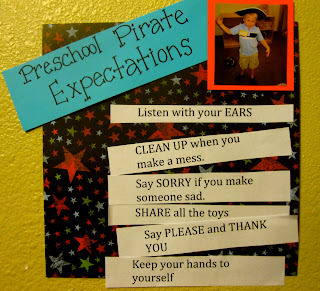 I created a little poster to put up in our kitchen labeled "Preschool Pirate Expectations..." with a picture of him at his preschool walk-through wearing a pirate hat. 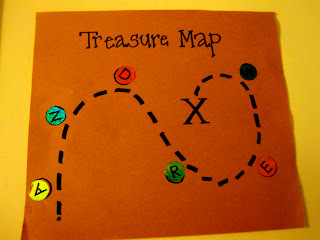 After the treasure hunt was over, we read each little slip of paper together (each had an expectation on it), and then he posted the white strips of paper on the poster. We reviewed each expectation and talked about why each one was important- especially for making friends. 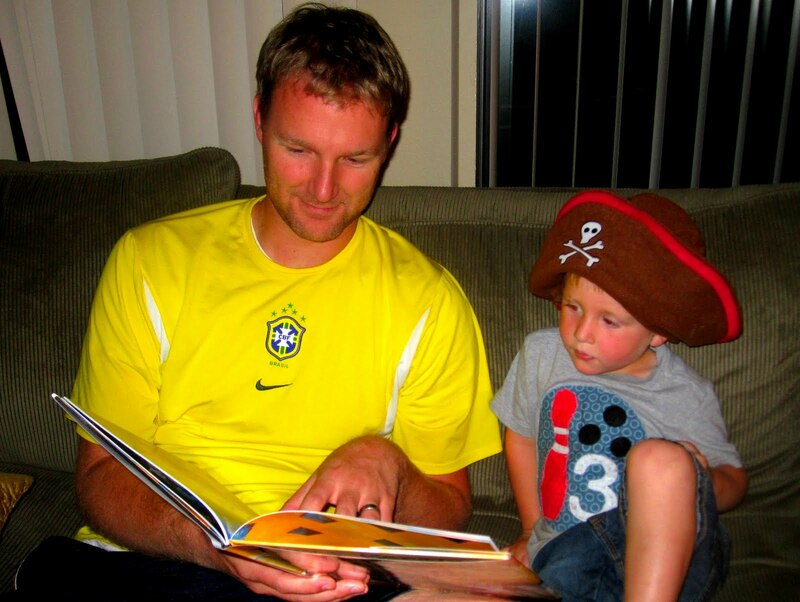 My favorite moment was when I asked my little guy what Preschool Pirates say if someone does something nice for them... and he yelled "Argh!" Our little preschooler ended up having a great first day... although we'll be reviewing the "keep my hands and objects to myself" rule again and again (he bopped a little girl with a bucket the first day... so I guess he did technically keep his hands to himself... :) ). My husband and I really enjoyed spending the evening getting excited about preschool with our son and making it special. 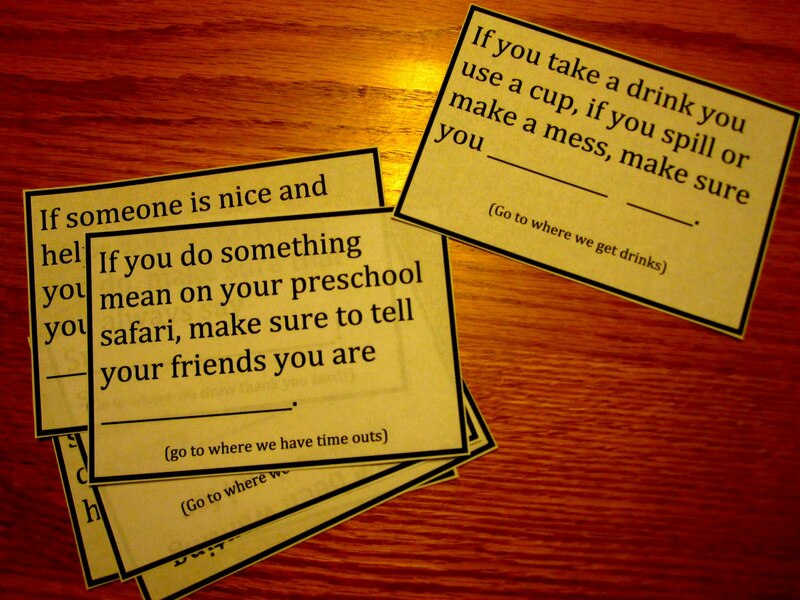 In addition to talking about these expectations, we also talked a lot about making new friends and having fun. I think it was definitely a memorable start to the year! 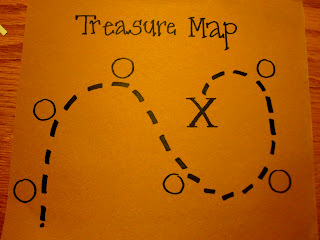 He looooved the treasure hunt and has been re-enacting it all week. 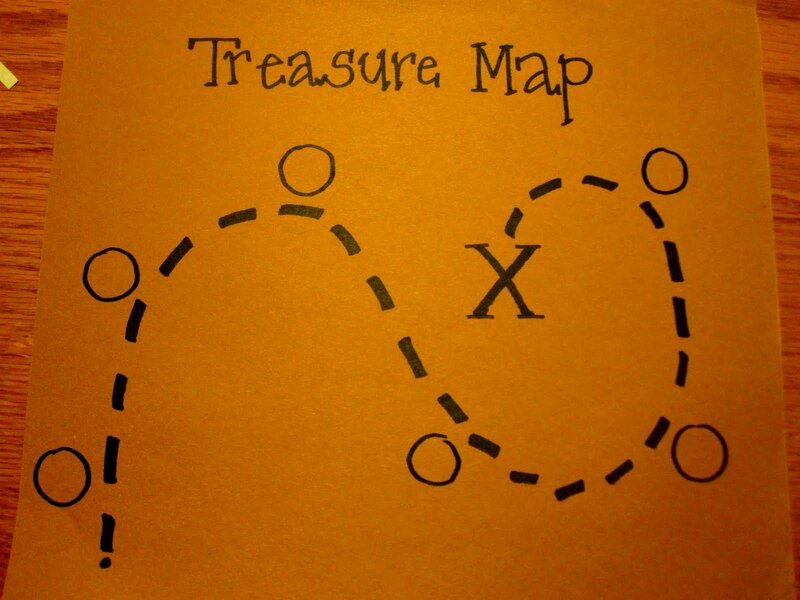 It was inspired by my cousin Jenny's amazing treasure hunt she did at her daughter's b-day party last month (in a pirate get-up with an accent... I am not that cool). Now I am dying to do a pirate themed week of activities/crafts. Instead I have just been pinning them on Pinterest. Below are a few of my favorites. The links are underneath the pictures. Have a great weekend! 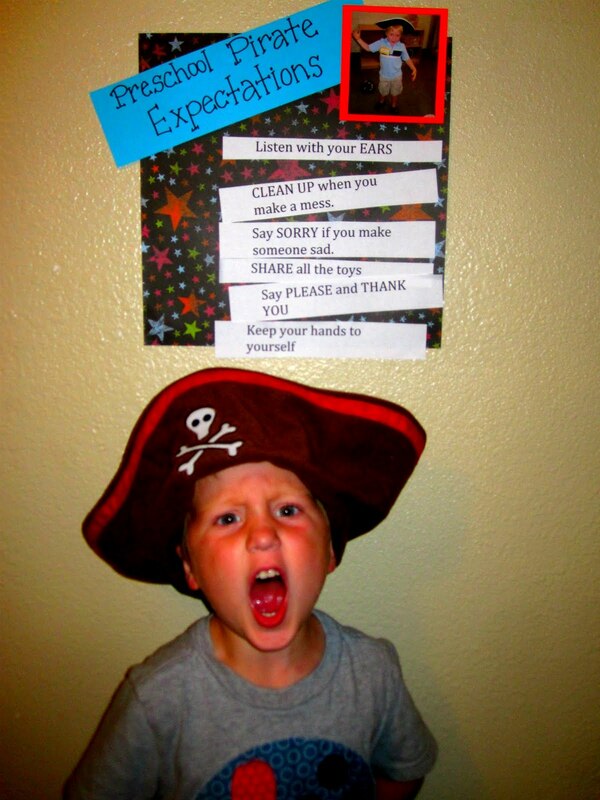 Don't you wish you were throwing a pirate party now too? Thanks for this post! My about-to-turn-4 sidekick has requested a pirate themed birthday party this month and you've added some great ideas to my list! Much appreciated. What a great post! I have two little pirates in training. Stopped by from Link & Learn. What a wonderful ideas! I love your game and the lessons tied to it. What a great adventure you gave your son! Thanks for sharing!